METAICHMIO Publications was founded in 1993. 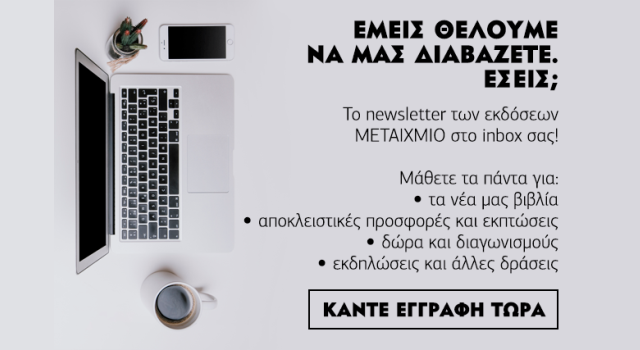 According to the official records of the National Book Centre of Greece (EKEBI), Metaichmio is one of the most important and leading publishing companies in translated and Greek fiction as well as in children’s and educational books, academic books, biographies, contemporary comment and graphic novels. METAICMHIO’s successful course has ensured its strong presence in the overall market. Today, the company is in full growth and the valuable experience gives confidence for the future. Aims are high, while quality remains the common feature of all METAICHMIO's titles. → Fruitful relationships with some of the most eminent and best-selling Greek authors. → Outstanding titles and award winning books by highly acclaimed authors. → Cooperation with the most important international publishing houses and agencies. → Acquisition of exclusive translation rights for significant books. → Books that combine educational value and quality entertainment. → Internationally acclaimed Greek authors. → Pioneer in educational books and study companions. Today 50 people are employed in METAICHMIO’s several corporate departments: marketing and promotion, sales, rights, production, editorial, creative (DTP) and accounts. Furthermore, METAICHMIO Publications has established long-standing relationships with people coming from all publication-related sectors, such as writing, translation, publishing, web designing etc. The whole process of making and selling a book, ranging from title selection and cover design to promotion and distribution all over Greece, is carried out within the technologically sophisticated facilities of the company.